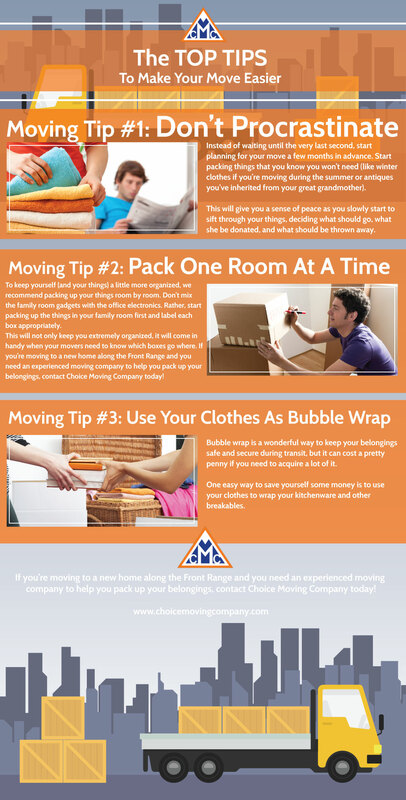 Moving can be an extremely exciting time, but packing up all of your belongings can be daunting. You don’t truly realize how many belongings you have until you have to stuff things into boxes and move them out of your home. Luckily, there are a few things you can do to make the moving and packing process easier, and in this blog, that’s exactly what we’ll cover. It’s easy to procrastinate packing. So easy, in fact, that many people wait until the very last minute to pack up their clothes, fine china, and office electronics before a move. This can leave you feeling overwhelmed, stressed, and pressed for time. Don’t let this be you. Instead, start to plan for your move as soon as you know where you will be going. If you’re traveling across the country, you’ll need to get a head start on finding a reputable moving company to help you transport your belongings. If you’re traveling across state or across town, there’s a good chance you can do a majority of the legwork on your own (but that doesn’t mean you should). Instead of waiting until the very last second to get your life together, start planning for your move a few months in advance. Start packing things that you know you won’t need (like winter clothes if you’re moving during the summer or antiques you’ve inherited from your great grandmother). This will give you a sense of peace as you slowly start to sift through your things, deciding what should go, what she be donated, and what should be thrown away. To keep yourself (and your things) a little more organized, we recommend packing up your things room by room. Don’t mix the family room gadgets with the office electronics. Rather, start packing up the things in your family room first and label each box appropriately. This will not only keep you extremely organized, it will come in handy when your movers need to know which boxes go where. If packing boxes isn’t really your cup of tea and you’d rather hire a professional, call the experts at Choice Moving Company in Fort Collins. Our team is fully licensed and insured and when you work with us, you never have to worry about hidden fees and expenses like you would with the other moving companies. Bubble wrap is a wonderful way to keep your belongings safe and secure during transit, but it can cost a pretty penny if you need to acquire a lot of it. One easy way to save yourself some money is to use your clothes to wrap your kitchenware and other breakables. Consider using sweaters or jackets for extra fragile items like electronics and use t-shirts, pants, and other garments for glass cups, plates, and the like. You can even use your socks to pack your glasses and stemware. If you’re moving to a new home along the Front Range and you need an experienced moving company to help you pack up your belongings, contact Choice Moving Company today!